Maintain 6 knots or slower within 100 feet of a vessel, shore, pier, piling, bridge structure, abutment or person in the water. Have PWC equipped with an operating self-circling device or lanyard-type kill switch. - Operate between sunset and sunrise. - Jump, or attempt jumping, the wake of another vessel, within 100 feet of the vessel. - Operate within 300 feet of people in the water or surf fishing activities in Atlantic ocean waters. - Disturb waterfowl and wildlife. - Operate in a reckless or negligent manner. YOU COULD RECEIVE FINES UP TO $500 FOR VIOLATING THESE RULES! As of July 1, 2012, all PWC operators regardless of age must complete a boater safety course. PWC operators must be at least 14 years old. Persons less than 14 years of age shall not operate a Personal Watercraft. Persons aged 14 and 15 must present proof of passing an approved boater education course, carry it on their person when operating and present it to a law enforcement officer upon request. Each person on a Personal Watercraft (PWC) must wear a Coast Guard approved PFD. Inflatable lifejackets are prohibited from being used while skiing, riding on or operating a PWC, or by anyone under the age of 16. Additionally, the operator must wear a lanyard type cut off switch provided by the manufacturer which will shut off the PWC should the operator fall off. PWC operators must carry a USCG-approved fire extinguisher and a sound producing device onboard. PWCs must come to "No Wake" speed within 50 feet or less of piers, boathouses, boat ramps and people in the water and another boat other than other PWCs. It is illegal to operate a PWC from sunset to sunrise. You may not carry passengers in excess of the number for which the craft was designed. It is also unlawful to carry more passengers than the PWC is rated to carry. Always carry the registration card when operating a PWC and do not operate while under the influence of drugs or alcohol. 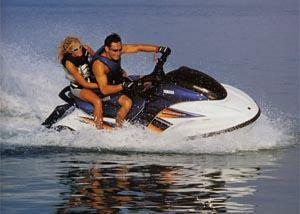 The operator of a Personal Watercraft should operate in a reasonable and prudent manner. This includes being aware of other boats in the operating area, awareness of environmental concerns and respecting the rights of shoreline property owners. The PWC operator should not follow other boats closely and should not jump the wake of other boats. Remember, the operator of a PWC will not be able to steer a PWC when the throttle is released or the engine is cut off. - Weaving through other vessels which are underway, stopped, moored or anchored while exceeding a reasonable speed. - To follow another vessel or skier, cross the path of another vessel, or jump the wake of another vessel more closely than is reasonable and prudent. - To cut between the towing vessel and a skier. - To spray or attempt to spray an object or person with the wash or jet spray of the PWC. All boat operators 30 years old and younger must have their boating safety certification and must have the certicate with them while operating a boat. 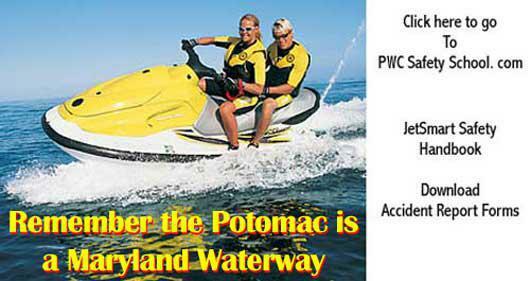 Want to learn more about boating and PWC safety in MD waters? Click here. Virginia Boating License or Boater Education Card... is there a difference? Instead of the term boating license, Virginia refers to its mandatory proof of education as a Boater Education Card. Unlike a "license", a boater education card does not expire and does not need to be renewed. Therefore, although the term is often used, it is technically incorrect to call the card a Virginia Boating License. A boating licenses is required for anyone operating a boat on District waters. All boat registrations expire yearly on December 31st. A renewal should be sent in the mail. Renewal can be done by mail or in person. Information on the D.C. Boating Safety Course can be found here. If you operate in both Virginia and Maryland waters you will need to make sure to take the boating safety course to be legal while in Virginia.